The 24-year-old was stretchered off during Sunday's 2-1 win over Leicester following a strong tackle by Jamie Vardy. 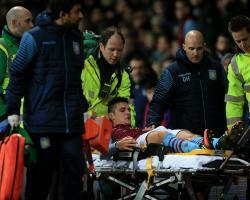 Villa were confident the injury was not as bad as first feared but the former Crewe player will still miss up to five games, starting with Saturday's derby at West Brom. Westwood has been a key man for Villa manager Paul Lambert since signing from Crewe in 2012 and set up Ciaran Clark's equaliser against the Foxes. Fabian Delph has returned to training following a dislocated shoulder to temper the Westwood news but Villa are still stretched at the back. Manchester United loanee Tom Cleverley also came off against Leicester with a bruised foot and is a doubt for the trip to The Hawthorns.